Goodbye, my white painted living room. 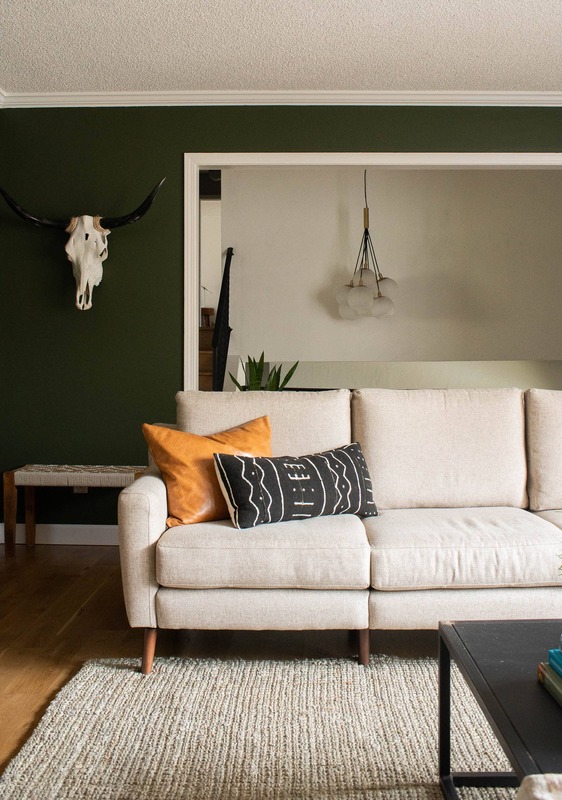 Hello, my moody, comforting, forest green living room. 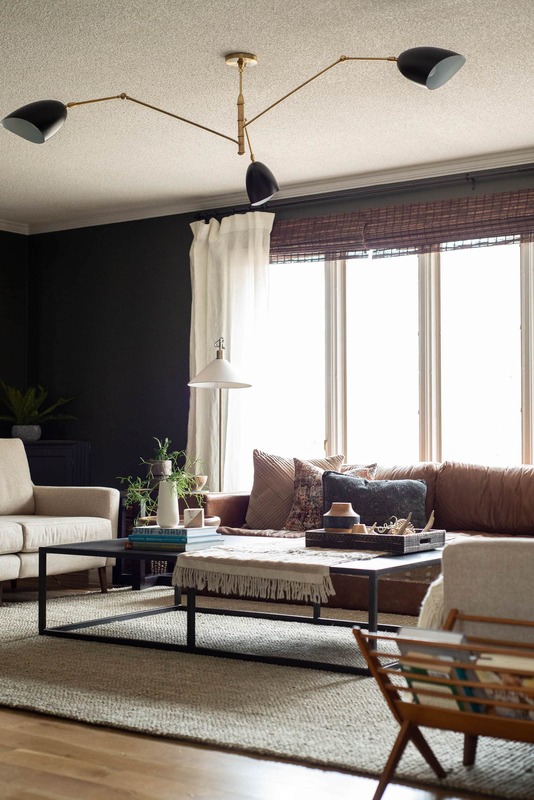 We went from a light and bright living room to a dark green living room and I’m sharing all about that today! You all know what our living room has looked liked. It’s been pretty yet it has never felt welcoming or quite right. Luke has always loved the living room painted white but I’ve been ready for a change. The living room faces north, so the light in the space is never overly bright and I just felt like the white never added anything to the space. I can be a bit lazy when it comes down to actually doing a DIY job. Seriously, I can. I’ve put off painting the living room for over a year and then finally I just decided to do it. Let me let you in on a secret. When Luke goes on work trips, I get the biggest kick out of trying to surprise him with a project when we comes back. Ha! I’m sure he’s used to it by now, but it’s always a joke about what is going to change before he gets home. Well, he left a few weeks before Christmas and I set out to paint our living room green. Can I be super honest and say that painting your living room green (or any type of painting in your living room) is not ideal when you have your living room decorated for Christmas. I had to move all the Christmas decor, broke a few ornaments, etc. I wouldn’t recommend doing that but I did it and now it’s done. 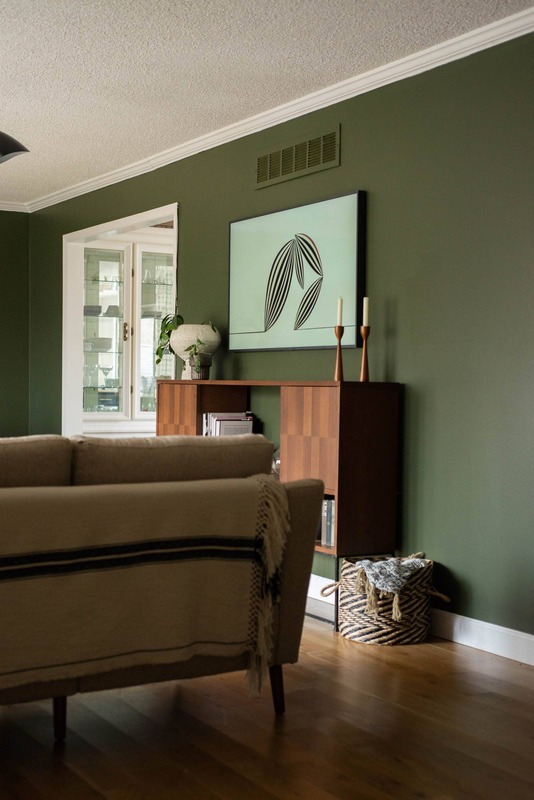 I’d been talking to Luke about dark colors for the walls for months. I got a few swatches and just couldn’t pull the trigger. 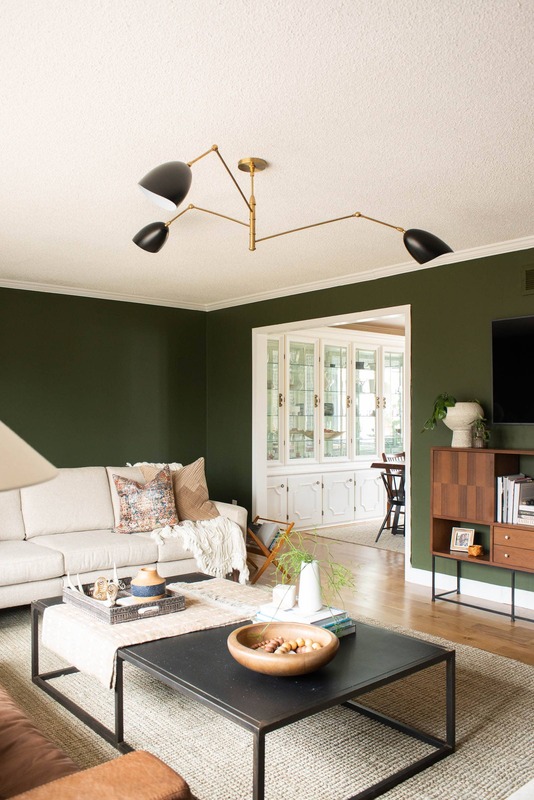 Then, I had a lightbulb moment and knew that I wanted the same depth of shade as our kitchen cabinets but I wanted it to be a forest green paint. 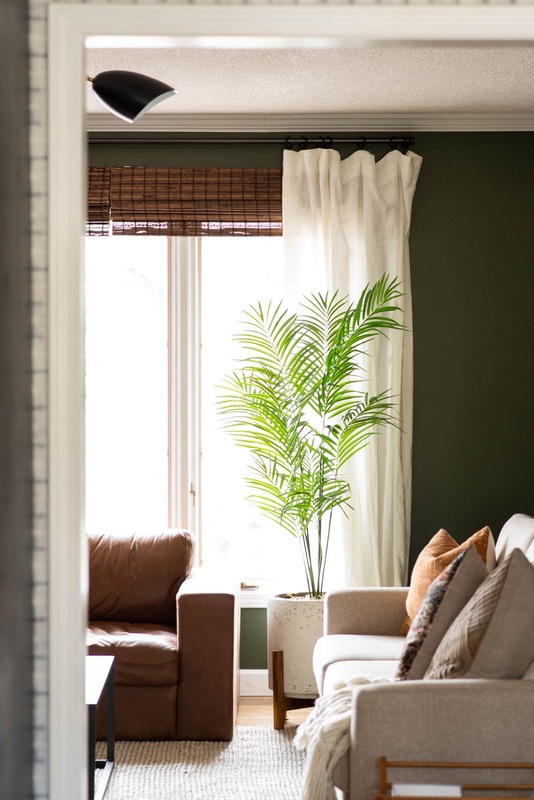 Green Living Room Walls – Do you Love or Hate? I love them much more than the white color that we had! Luke is indifferent; or actually, I think he secretly doesn’t like the green paint color but won’t say anything overtly negative. I ended up going with Fig Tree by Behr with two extra shots of black. 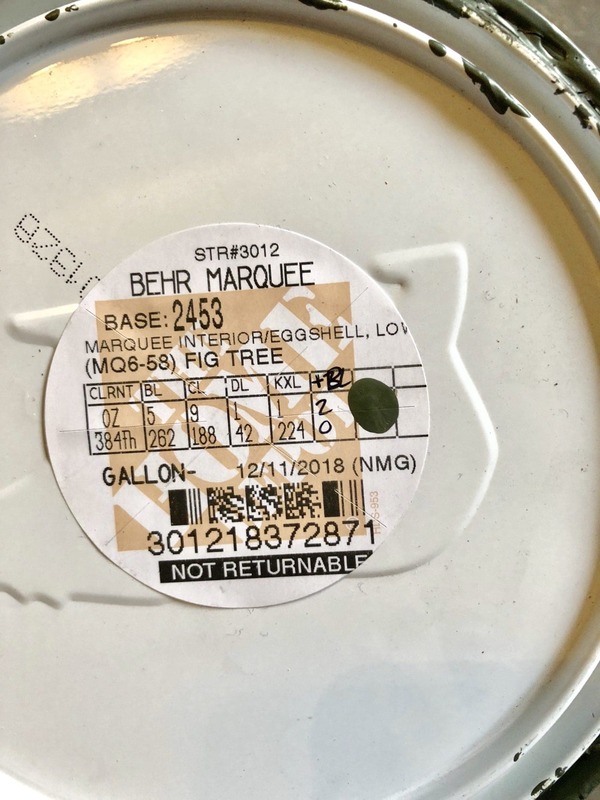 I’ll give you a picture of the paint formula so you can get the same color if you are interested. I think going dark on the living room walls was meant to be. It helps make the space in our living room more cozy. I’m not 100% sure that I picked the right depth of paint color though. I kinda wish I had gone even darker. Let’s settle for baby steps in the right direction and chalk this up as a win. So, tell me… do you like the new vibe of our living room? Overall, I love the direction but I do think it’s lacking character. As we go on, hopefully I’ll find my way in adding character.